The placement and restoration of your new mini implants can often be completed in just one appointment, and patients typically only need a few days to heal from the procedure. 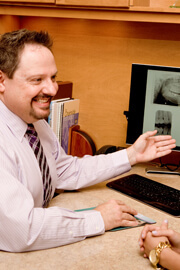 Because of the smaller size of the implants, the surgical procedure is less invasive and rarely requires bone grafts. In most cases, even reduced jawbone structure can support mini implants successfully. The cost of mini implants is significantly reduced when compared to traditional implants. Mini implants are stable, durable, and confident. Patients currently wearing traditional dentures will be surprised and amazed by how much of a positive difference they can make regarding the security of your smile. Depending on the patient’s personal needs and current oral health, mini implants can be used to anchor either fixed (permanent) prosthetics or removable appliances.